One key concept in Karl Marx’s theory of capitalist economic crisis is “the destruction of capital through crises” (Marx 1989: 127, emphasis omitted). He meant by this not only the destruction of physical capital assets, but also, and especially, of the value of capital assets. This paper analyzes the current crisis in the light of that concept. I will argue that the crisis is rooted in the fact that capital was not destroyed to a sufficient degree during the global economic slump of the mid-1970s. Unless and until sufficient destruction of capital occurs (perhaps in the present slump?) there can be no new, sustainable boom. This is because the destruction of capital restores profitability; without enough destruction of it, profitability will remain too low. Yet policymakers, unwilling to allow capital to be destroyed to a sufficient degree, have repeatedly chosen to “manage” the relative stagnation by encouraging excessive expansion of debt. This artificially boosts profitability and economic growth, but in an unsustainable manner, and it leads to repeated debt crises. The present crisis is the most serious and acute of these. Policymakers are responding to the crisis by once again papering over bad debts with more debt, this time to an unprecedented degree. I will conclude by exploring some possible consequences and political implications of this response. In an economic slump, machines and buildings lie idle, rust and deteriorate, so physical capital is destroyed. More importantly, debts go unpaid, asset prices fall, and other prices may also fall, so the value of physical as well as financial capital assets is destroyed. Yet the destruction of capital is also the key mechanism that leads to the next boom. For instance, if a business can generate $3 million in profit annually, but the value of the capital invested in the business is $100 million, its rate of profit is a mere 3%. But if the destruction of capital values enables new owners to acquire the business for only $10 million instead of $100 million, their rate of profit is a healthy 30%. That is a tremendous spur to a new boom. Thus the post-war boom which followed the massive destruction of capital that occurred during the Great Depression and World War II came about as a result of that destruction. If, on the other hand, capital is not destroyed to a sufficient degree, there is no boost in profitability. Yet why isn’t profitability great enough to sustain an economic boom even without such a boost, without capital being destroyed? The answer, I believe, is that the “underlying” rate of profit––the rate toward which the empirically observed rate of profit tends in the long-run, all else being equal––is chronically too low to permit a healthy rate of economic growth. The “underlying” rate depends in part upon the rate of growth of surplus-value, and thus upon the rate of growth of employment, but this latter rate is held down by labor-saving technical progress. 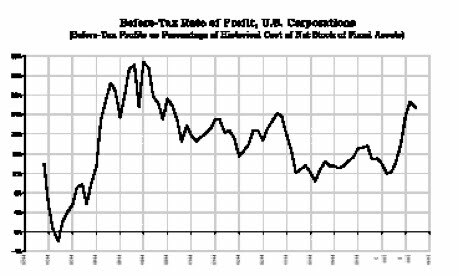 There are several other determinants of the “underlying” rate of profit as well, all of which seem to be fairly stable in the long run. There is thus little reason to expect the “underlying” rate to rise or fall over time. One might infer from this conclusion that I reject Marx’s law of the tendential fall in the rate of profit. Actually, the opposite is the case. If it is indeed the case that the “underlying” rate of profit is chronically too low to sustain a boom, and that the empirically observed rate of profit tends in the long-run to converge upon this too-low “underlying” rate, then the rate of profit does tend to fall if it initially starts off at a higher level. That will be the case at the start of every boom, after the crisis and the attendant destruction of capital have boosted the observed rate of profit. I believe that the tendential fall in the rate of profit to which Marx referred is just this tendency of the observed profit rate to fall downward toward the “underlying” rate (see Kliman 2003:123–26). This falling tendency persists until capital is once again destroyed to a degree sufficient to offset it. In the 1970s and thereafter, policymakers in the U.S. and abroad have understandably been afraid of a repeat of the Great Depression, especially of the destabilization of the capitalist system and the radicalization of working people that accompanied it. They have therefore repeatedly attempted to retard and prevent the destruction of capital. This has “contained” the problem, while also prolonging it (and, I shall argue, exacerbating it). As a result, the global economy has never fully recovered from the slump of the 1970s, certainly not in the way in which it recovered from the Great Depression and World War II. 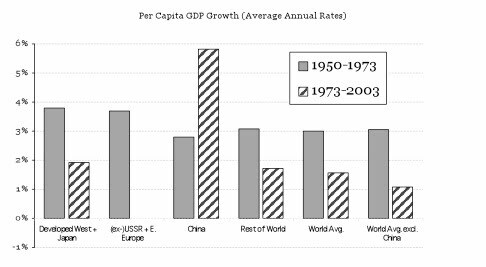 For instance, in the developed “Western” countries (including Japan), and in the world as a whole, the average growth rate of Gross Domestic Product (GDP) per person during the 1973–2003 period was just barely more than half the growth rate between 1950 and 1973 (see Figure 1). Excluding China, the worldwide growth rate fell by almost two-thirds. been destroyed on a massive scale, the rate of profit averaged 28.2%. The high rate of profit in the early part of the 1941–1956 period was partly due to government borrowing and spending during World War II, but the rate of profit remained very high for more than a decade thereafter, which is clear evidence of a sustained boom rather than a debt-induced bubble. However, the rate of profit then fell to an average of 20.4% in the 1957–1980 period. Moreover, despite frequent claims that neoliberal policies and globalization brought about a sustained recovery from the crisis of the 1970s, the rate of profit continued to fall in the1981–2004 period, to an average of 14.2%. The sharp rise in the rate of profit in the 1941–1956 period, and the lack of a sustained recovery in profitability following the crisis of the mid-1970s, is consonant with the above analysis of the effects of full-scale versus incomplete destruction of capital. It is also consonant with the hypothesis that the observed rate of profit has a tendency, in the absence of a sufficient destruction of capital, to converge upon a too-low “underlying” rate. In order to mitigate the effects of this phenomenon, and perhaps hoping to overcome it, policymakers have tried to prop up growth and profitability artificially throughout the last three decades. For instance, the slump has been contained in the developed countries to some degree by “exporting” it to the most vulnerable parts of the Third World. In the U.S., profitability has been propped up by means of a decline in real wages for most workers and other austerity measures. Most importantly for the present analysis, the sluggishness of the economy has been papered over by an ever-growing mountain of mortgage, consumer, government, and corporate debt. For instance, reduced corporate taxes have boosted the after-tax rate of profit relative to the pre-tax rate, but this boost has been financed by additional public debt. More than three-eighths of the increase $6.8 trillion increase in U.S. Treasury debt after 1986 (through fiscal year 2007) is attributable to reduced corporate taxes as a percentage of corporate profits. Almost all of the remaining increase in the government’s indebtedness is used to cover lost revenue resulting from reductions in individual income taxes, reductions that have served to prop up consumer spending and asset prices artificially. Similarly, the effects of declining real wages have until recently been mitigated by easy-credit conditions and rising prices of homes and stocks, brought about by Federal Reserve policies and other means. This has allowed consumers and homeowners to borrow more and save less. Whereas Americans saved about 10% of their after-tax income through the mid-1980s, the saving rate then fell consistently, bottoming out at 0.6% in the 2005–2007 period. In the long run, however, debt cannot be used to "grow the economy" faster than is warranted by the underlying flow of new value generated in production. Efforts to do so create bubbles, but bubbles burst. The current economic crisis, which began with and remains centered in the crisis in the U.S. housing market, provides a striking example of this phenomenon. 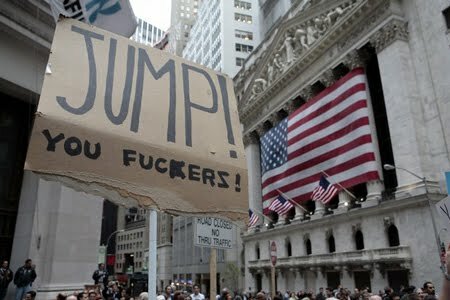 In large part because the Federal Reserve pursued a “cheap-money, easy-credit” strategy in order to prop up the economy in the wake of the collapse of the dot-com boom, 9/11, the recession of 2001, and the drop in employment that continued into mid-2003, home mortgage borrowing as a percentage of after-tax income more than doubled from 2000 to 2005, rising to levels far in excess of those seen previously. This caused home prices to skyrocket. Mortgage debt and home prices both doubled between start of 2000 and the end of 2005. But the rise in home prices was far greater than the growth of value from new production that alone could guarantee repayment of the mortgages in the long run. New value created in production is ultimately the sole source of all income, including homeowners’ wages and salaries, and therefore it is the sole basis upon which the repayment of mortgages ultimately rests. Between 2000 and 2005, total after-tax income rose by just 35% percent, barely one-third of the increase in home prices. This is precisely why the real-estate bubble proved to be a bubble. Thus, in the period since the crisis of the mid–1970s, there have been recurrent upturns that have rested upon debt expansion. For that reason, they have been relatively short-lived and unsustainable. And the excessive run-up of debt has resulted in recurrent crises, such as the Third World debt crisis of the early 1980s, the savings and loan crisis of the early 1990s, the East Asian crisis that spread to Russia and Latin America toward the end of the decade, the collapse of the dot-com stock market boom shortly thereafter, and now the crisis in the U.S. housing market that has triggered the most acute economic crisis since the Great Depression. Policymakers are responding to this crisis with more of the same––much, much more. The U.S. government is borrowing a phenomenal amount of money, for the $700-plus Troubled Assets Relief Program (TARP), Obama’s stimulus package, etc., etc. If these measures succeed, full-scale destruction of capital will continue to be averted. But if the analysis of this paper is correct, the consequences of success will be continuing relative stagnation and further debt crises down the road, not a sustainable boom. To repeat, unless sufficient capital is destroyed, profitability cannot return to a level great enough to usher in a boom. And given the huge increase in debt that the U.S. government is now taking on, the next debt crisis could be much worse than the current one. It is therefore not unlikely that the next wave of panic that strikes the financial markets will be even more severe than the current one, and have more serious consequences. If the new policy measures fail, we may soon be facing a very severe slump. It might not be as nearly as bad as the Great Depression, but it might be even worse. It might lead to full-scale destruction of capital and a new boom, but in the 1930s, capitalism’s self-correcting mechanisms proved too weak to bring that about. Recovery required both massive state intervention––which is taking place again––and the destructiveness of World War. This time around, it is not inconceivable that we will descend into fascism or warlordism before that point is reached. Now that a shift away from the “free market” and toward government intervention and regulation is taking place, it is important to recognize that there is nothing inherently progressive about this. It is true that during the New Deal, intervention and regulation were accompanied by some progressive social welfare policies, but that was because a gigantic mobilization of working people forced the U.S. government to make concessions in order to save the capitalist system. If it can save the system without giving such concessions, increased intervention and regulation will be just that––intervention and regulation, period. We have already seen that the TARP bailout money isn’t there to make our lives better. As in the 1930s, working people need to mobilize in order to protect themselves during the crisis as well as they can. They need to look to themselves, not to the government. By getting their demands met, they will help themselves in the short run. We should be aware, however, that concessions are not a solution to the economic crisis, not a pathway to a new boom. Concessions do not restore profitability, but as long as we remain within the confines of the capitalist system, a new boom will require destruction of capital to an extent sufficient to restore profitability. We may soon be in a situation in which great numbers of people begin to search for an explanation of what has gone wrong and a different way of life. We need to be prepared to meet them halfway with a clear understanding of how capitalism works, and why, when push comes to shove, it cannot work to the benefit of the vast majority. And we need to get serious about working out how an emancipatory alternative to capitalism might be a real possibility. Westra and Alan Zuege (eds. ), Value and the World Economy Today (London and New York: Palgrave Macmillan). Kliman, Andrew. 2008. A crisis for the centre of the system. International Socialism, No. 120. Available at http://isj.org.uk. These other determinants are the rate of exploitation, the share of profit that is reinvested, and the rate of increase in nominal values (prices) relative to real ones. The first two move within strict limits and should be expected to be roughly constant over the long run. If there is not an excessive run-up of debt (which, I argue below, is ultimately self-negating), so should the last determinant. See Kliman (2003:123–26) for a fuller discussion. The Okishio theorem was long thought to have shown that Marx’s law is a logical impossibility, but the theorem has been disproved. See Kliman (2007, Chap. 7). I have used the authoritative data compiled by Angus Maddison for the 1950–2003 period, available at www.ggdc.net/maddison/Historical_Statistics/horizontal-file_03-2007.xls. His GDP figures are measured in constant 1990 international dollars (Geary-Khamis dollars). The data come from the Bureau of Economic Analysis of the U.S. Department of Commerce, available at www.bea.gov. Profit data are from NIPA Tables 6.17 A though D, line 1, and fixed asset data are from Fixed Asset Table 6.3, line 2. I have divided profits by the cost of fixed assets at the end of the prior year. See Kliman (2008) for sources and further analysis of the housing market crisis. Figure 2 provides some indication of the effects of debt-induced expansions. Accelerating inflation artificially propped up the nominal rate of profit in the mid-to-late 1970s, but ultimately led to a disinflationary slump; it also helped prolong a boost in the price of oil that gave rise to the Third World debt crisis. The 1990s was the decade of “the new economy,” a debt-financed dot-com boom that ended as a burst bubble. And of course the spike in profitability between 2002 and 2007 was debt-driven and unsustainable. Impressive-looking forecasts notwithstanding, no one knows or can know at this point. In the absence of stable conditions and meaningful precedents from the past to draw upon, forecasts are little more than hunches with numbers attached.